Here’s a photo of Freedom cribbing back in 2009. Old style fencing like this was used to measure the area of fields. there’s a concern, mostly unfounded, that the vice will spread like a virus through a barn (Freedom has been with the same turnout buddies for close to a decade without any of them picking up the habit). At our old barn, Freedom’s cribbing wasn’t a huge deal. He wears a cribbing collar which reduces his cribbing significantly. When he did crib, his preference was to grab the top of a post and pull on it. The posts would start to lean and then I, or the person who helped maintain the property, would reset the post. He never has colicked from it and his teeth are still in decent shape. The fencing where Freedom lives looks like this — the rails slot into holes in the posts. zigs and zags between two posts, each rail was generally 16.5 feet or one “rod”. This allowed landowners to calculate the area of a field by counting the zigs and zags along the side and one end. But it’s not really meant to withstand cribbing. While Zelda has learned to slide the rails out of the posts, Freedom has discovered that shaking the fence, by grabbing a post to crib on it, can cause the rails to tumble down. Not ideal when the purpose of the fence is to keep the horses in! In some places I’ve put electric tape up using offsets to protect the poles, but that does little to protect the posts. Willow looks skeptically at the new offset fence. 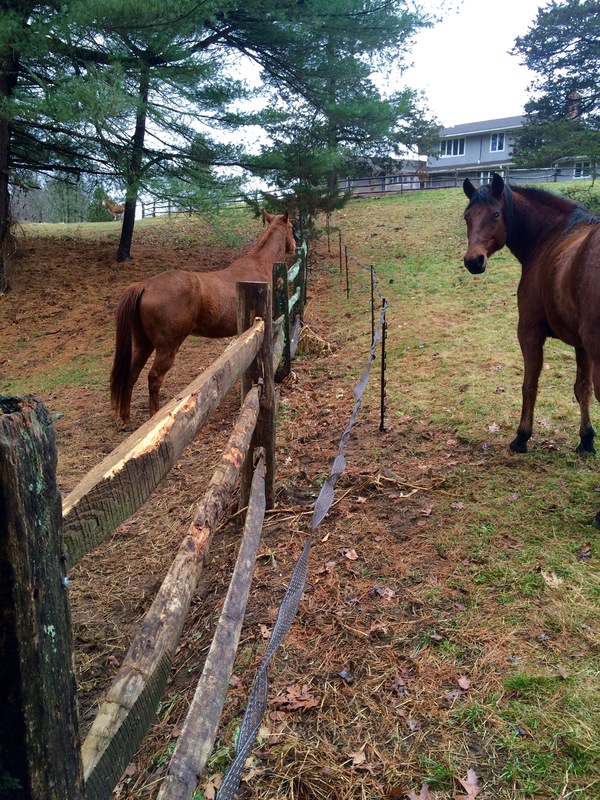 She likes to tease Dandy (the chestnut) and is a bit PO’d that she can’t get closer. So, when Freedom managed to pull down some fencing last week, I decided to build an internal electric fence to keep him away from the wood altogether. Using short step in poles and some old tape (if this works, I will get some new tape), I built a fence within the fence. And then ran enough current down it to discourage any horses from testing the line. So what about his cribbing? The Barn Owners were kind enough to create a “cribbing station” for him. He now has his own post that is sunk into the ground that’s not attached to anything. I’m hoping that by eliminating the “bad options” we can direct him toward a solution that will allow him to crib a little, but without doing any damage. I will let you know how it works! That’s really smart…a cribbing station…keep us posted for sure.